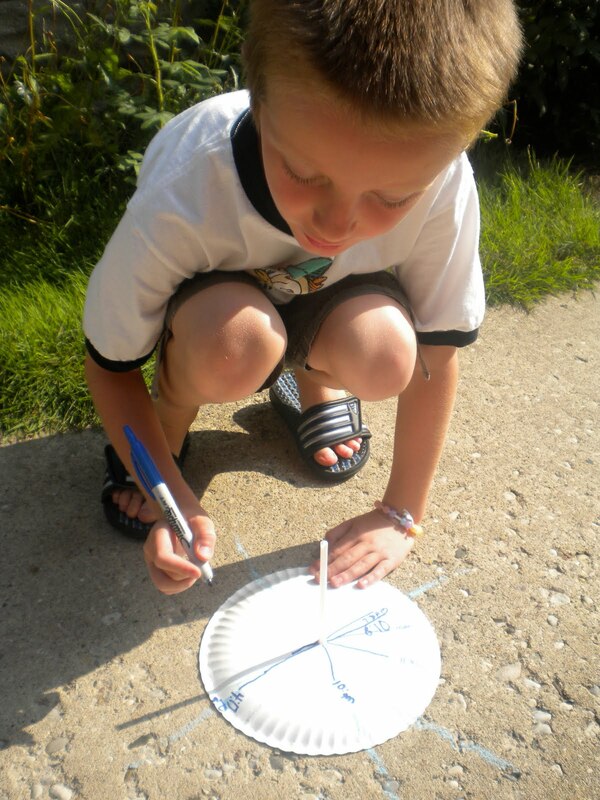 Last year we did a little sun science and the kids really enjoyed it, so this year we mixed it up just a little bit. 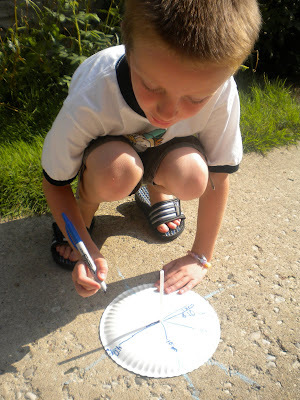 We started by making sundials (inspired by this post). I took a paper plate and made a hole in the center with my awl. Then I popped a straw through the hole and taped it in place on the bottom (well the top when you're eating on the plate, the bottom when it's a sundial). Then we set them up in a spot on the driveway that would get light all day (big improvement from last year) and made registration marks with chalk so we could put them back in place when they blew away (and they did!). I'm not sure if either of the kids fully "got" the science part here, but they were diligent about reminding me that they needed to go out and mark the shadow. We started at 7:30am and ended at 5:00pm (when things got cloudy on us). Project #2 happened after nap and both kids thought it was just our typical crafting project. 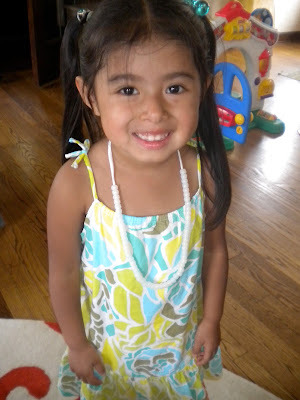 EJ made a necklace (look at how great she is stringing those little beads!) and Jack made a bracelet. I was surprised but no one said a thing about how I only had white beads for them to string (but it certainly went a TON faster as Jack didn't spend time working out a pattern). And then showing off the trick that happened when I took them outside with their new jewelry. I pulled a fast one using special UV detecting beads that Leslie recommended. A huge hit my friend! They even hid EJ's necklace away from the window so they could "trick" Matt when he got home. I'm dying to see how these look tomorrow in brighter light/stronger UV rays. The photo above shows them as dark as they got at 4:30pm in semi-cloudy light. But the web site shows them much darker in mid-day sun. Another surprise for tomorrow I guess! What a fun surprise! I bet they LOVED seeing them change colors. Yay!! I'm glad they enjoyed them!! I still need to pick up a bag for my kids -- even my "big kids" will love them, I'm sure! Love the sundial project, too! Might have to implement that as well! once again ... fun & genius projects!!! gonna have to look into those beads ... i got some girlies that'll love those!